Under the country’s Constitution, the head of state annually addresses the parliament – the State Duma and the Federation Council – to outline key priorities in domestic and foreign policy. 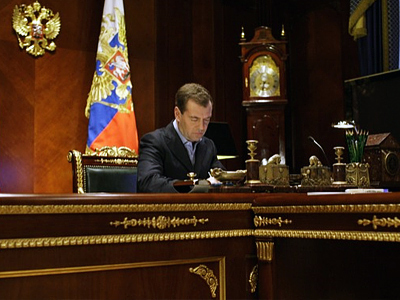 Current State-of-the-Nation address is the third one since Dmitry Medvedev took office in 2008. Members of Russia’s political elite as well as over 300 journalists were present at the Kremlin’s Georgievsky Hall to listen to the president’s speech. Russian President started his address with a brief summary of the latest events in the economic sphere. 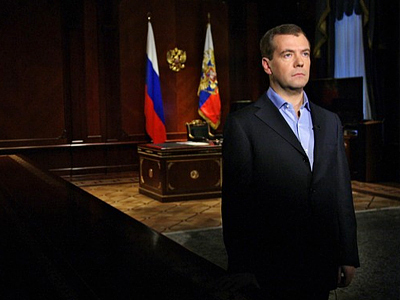 According to Dmitry Medvedev, Russia has successfully overcome the financial crisis. The authorities expect up to four per cent economic growth this year, and the number of employed people rose by two million. There are still some remaining effects of the crisis, the president said. 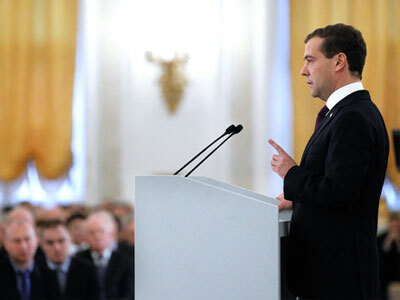 Dmitry Medvedev also said that Russia made serious progress in development of the hi-tech sector. In particular, he mentioned that the number of orders for the Russian nuclear industry, both at home and abroad has grown 25 times in just five years. He also talked about the Lomonosov supercomputer that would be ready soon, about Russia’s own satellite positioning system Glonass, the development of digital television broadcasting and also the launch of the Cyrillic domain name system on the Internet. The Russian President promised that next year the state would allocate 30 billion rubles (about $1 billion) to scientific and educational centers in order to sustain the rate of modernization. He also said that the government and local authorities must concentrate on turning the Russian capital Moscow into an international financial center. Forming an efficient and modern policy towards children has been named “task number one”, and was at the core of this year’s speech. 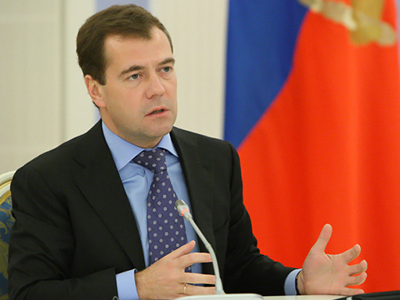 Medvedev noted that the demographic situation in the country has improved lately. However, he urged the necessity to improve healthcare system for children and to financial support for families who have to two and more kids. As both the issues are crucial for the country to make sure the nation will keep going and growing. The president noted that there are still 130,000 children in Russia who have no parents and live in orphanages. He stressed that it is necessary that authorities should aim to find new families for orphans and provide aid to foster homes. “There should be no ‘nobody’s children’ in our country,” he stressed. Yet another crucial problem to tackle is crimes against children, as well as involving youngsters in criminal activities. 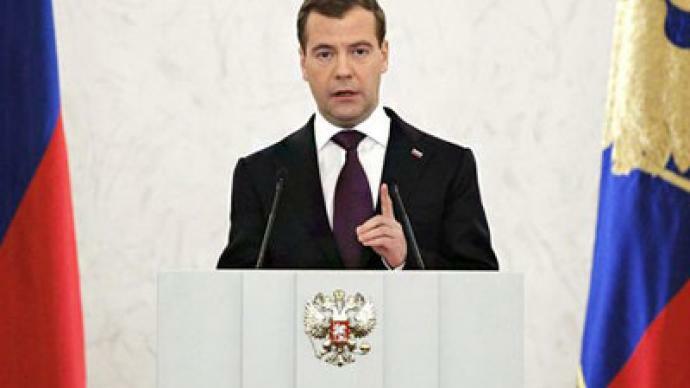 Medvedev said that last year alone, over 100,000 children in the country became victims of criminal offences. The president stressed that those who committed crimes against minors should be “severely punished” and the doors of all educational institutions and schools should be closed to them forever. Another issue mentioned in the presidential address was the ecological state of the nation. "The nation's health depends on what environment we will leave to our offspring," the president stressed. Dmitry Medvedev said that the problem was serious and that several measures aimed at its improvement must be taken in the nearest future. First of all, the Russian President noted the role of non-governmental organizations in environmental protection. He said that the authorities must start a dialogue with “those who show real concern about environmental protection” before large-scale infrastructure projects are even started (Medvedev referred to the so called Khimki Forest situation – large scale public protests that stopped the construction of the Moscow-St. Petersburg highway through a forest park in the suburban town of Khimki). The president also said that the government could introduce the “ecological amnesty” – the system under which the enterprises that take real measures to eliminate the violations of ecological norms are not subject to fines. However, this system must apply only to companies that undertake real measures for ecological restoration of the territory. The president said he had charged the heads of regions with making reports on ecological situation every year. 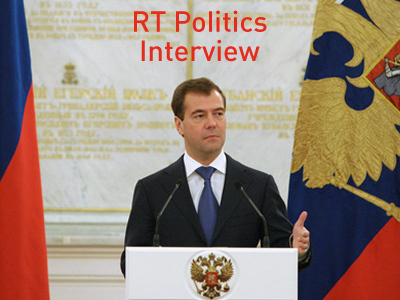 The Russian leader also spoke of the responsibility of civil servants before the population. He said that all those who hold state posts must understand that they work for the citizens and not vice versa. The president said that the state bodies must own only the property that they need for their operations and everything else must be privatized. “Bodies of power must not be owners of industrial plants, newspapers and ships, everybody must be engaged in their own activities,” Dmitry Medvedev said. The Russian leader also touched upon such an acute problem as corruption. He said that the current penal code does not stop officials from taking bribes and the current sanctions in the form of imprisonment do not scare bribe-takers. In connection with this, Medvedev suggested that commercial bribery, and also the giving and taking of bribes, must be punished by fines in the amount of up to one hundred times the amount of the bribe. The president also drew attention to the existing new type of criminal activity – people acting as middlemen in bribe-taking. He said that these middlemen, as well as the size of fines being proportionate to the size of bribes, must be included in the criminal code. Dmitry Medvedev said that fighting corruption remains one of the nation’s major tasks and that all previously made decisions must be analyzed and then society must move on. “The development of our state would be impossible if we didn’t ensure efficient national security and defense,” Medvedev stated. The country’s leader said that over 20 trillion rubles (about US$640 billion) will be spent to modernize the army. But this investment, the president said, could be quite effective if it yields so-called “dual technology” – helping the state modernize production and develop fundamental sciences at the same time. “You may like it or not, but over different periods in history, science and technology were advanced by security needs and governments invested in new technological solutions for defense,” he said. 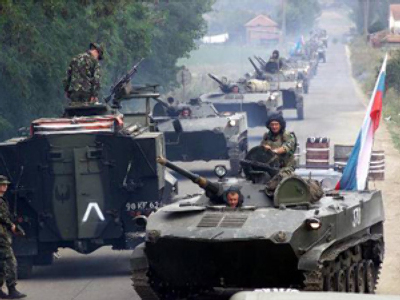 Today, Medvedev said, Russia is facing a fundamental task of creating a new, modern, hi-tech and mobile army. A special body – similar to those working in other countries – will be created to work on breakthrough technology for the defense industry, Medvedev said. As for the modernization of the state’s military forces, the president noted that several steps in the direction of Russia’s new army have been made, troops are being re-equipped and staff renewed. “Military drills have become regular – and what’s also important large-scale – again,” Medvedev outlined. Addressing the parliament, the president has also set a number of priority tasks that are to be solved. First of all, next year “special attention should be paid to strengthening the aerospace defense of the country.” Missile and air defense should be joined with early warning and space monitoring systems and operate under a single strategic command. However, the president said, there are two alternatives Russia is to face in the upcoming decade. “We will either come to an agreement on missile defense and create a joint mechanism of co-operation or, if we fail to come up with a constructive agreement, a new arms race will start,” Medvedev said. Speaking of the Russian political system President Medvedev said that the major changes were announced in his previous addresses. He said that the moderate reforms will continue, in particular, the authorities will continue to exercise the practice of public discussions of new draft laws, posted on the Internet and that minor parties will get more opportunities to influence the life in the country after changes are made to regional election rules. Medvedev outlined the plans to develop a special system of inclusive discussion of various draft laws, similar to the recent nationwide discussion of the draft law on police. He said that the draft law on education will be discussed in the same way in the nearest future. Medvedev charged the presidential administration with the task of preparing the special system for such discussions before the end of the year. As for the changes in the regional election system, Dmitry Medvedev said that the new rules would promote the voters’ confidence in the party system as well as enforce the parties’ responsibility before the electorate. Medevedev added that the next parliamentary elections, in December 2011 will be held under the new rules. The president also spoke of the role of non-governmental organizations in the system of state social services. Medvedev charged the government with creating the legal basis for NGO work within the state bodies and with broadening the competition system for NGO financing. He added that NGOs possess more information about the social situation in the regions and also can help to decrease the level of corruption in the state institutions. “Federal bodies must create a precise system for the selection of NGOs, sort out those that have earned a good reputation and have the population’s real trust; that work for many years,” Medvedev said. Speaking of foreign policy preferences, the Russian President said that he supported broader co-operation both with the European Union and the United States. This co-operation should develop in the field of economic co-operation, investment and common projects in the high-tech sphere. The Russian leader said that the co-operation with the European Union must also include joint technology projects, simplification of visa regime with its further cancellation and broadening the professional science and academic exchanges. Medvedev stressed the importance of Russia’s participation in the international affairs in the Asia-Pacific region as well as other regions of the World, such as Africa and Latin America, but at the same time he stressed that the CIS and international structures that work on its space will remain the top priority in the future. .
Medvedev said that Russia could offer the international community its unique experience in tackling emergency situations, such as natural and technological disasters. He noted the Russian initiative to create an international organization that would protect the environment, in particular fighting oil leaks at sea.